Bluebell’s babies are about 2 weeks old and their eyes had just opened the day I took these photos (a couple days ago)! They are learning to stand but are not quite standing yet and they are taking their very first shaky steps. Its amazing how in just 4 short weeks they will grow from these tiny infants that can barely stand to confidently bounding puppies, eager to lick hands and chase toys. Its really amazing! Patches is our little tri-colored blue merle boy. He is pretty adorable. And it seems like he is going to have one blue eye like his Mama, which is pretty cool. He has some lovely chocolate-red color on his silvery face and on his paws and under his tail as well, making him look like he has some phantom markings. He has a beautiful curl to his coat and will definitely be a curly little man. Pirate is our blue-merle boy with the adorable half-black face. He really does have such a sweet face that I pretty much want to kiss all day long. Look at his face and tell me you don’t want to kiss that little nose! 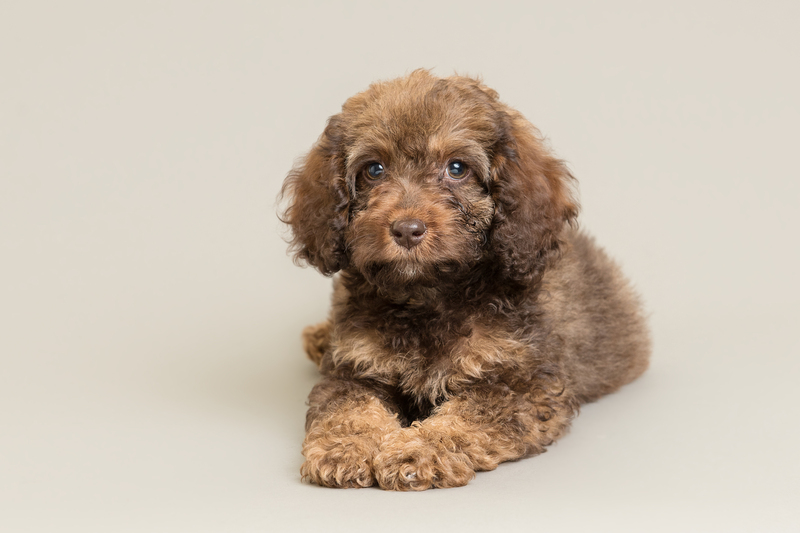 He has a silky coat that has a very nice curl to it and he will also definitely be a curly little man. Polly is our big puppy in this litter. Fatter, rounder features mean she favors the cocker spaniel bone structure like her father Jake. She is pudgy and very interested in eating. The rest of the time she is content to lay down wherever she finds herself. She seems to be a very easy going puppy. Her chocolate merle pattern is beautiful and I am really excited to see how she looks as she matures. Hope you’ve enjoyed the pictures! Excited to post more soon as these little babies start moving around and really opening those sweet eyes. 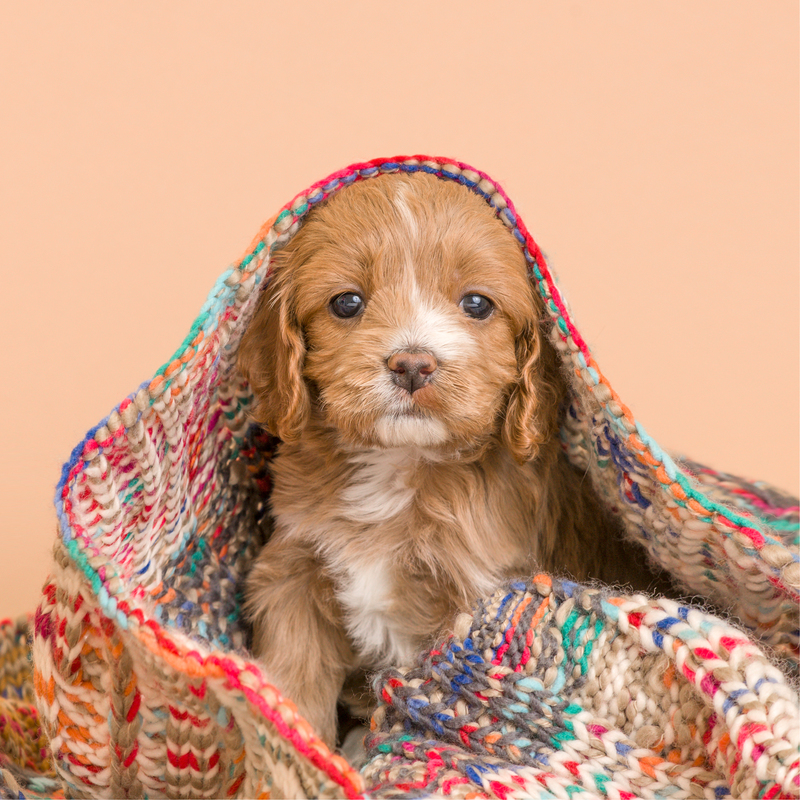 This entry was posted in 2015 Litters and tagged Bluebell, cockapoo, puppies, puppy. Bookmark the permalink. Hi Annette, I was wondering if there were any updates on bluebell’s babies. If you don't have a Wordpress account you can enter your email address to follow this blog and receive notification of new posts by email.